Blow to hareidi yeshiva system as Education Ministry plans to link yeshiva funding to IDF enlistment. Under a new plan, funding for yeshivas will be linked to the number of students who enlist in the IDF, the Education Ministry announced Tuesday evening. Yeshivas that send many students to the IDF will receive more points, which will translate to more financial assistance. “The initiative is part of a decision by the government of Israel aimed at encouraging yeshiva students to enlist in the military,” the Education Ministry statement said. If it is implemented, the new plan could be a huge blow to the hareidi yeshiva system, which would in all likelihood face a major budget cut. However, it should be noted that yeshivas which send many students on to IDF service already get preference when it comes to government funding. The announcement follows hints from religious-Zionist politicians that yeshivas in the religious-Zionist community may be saved from severe budget cuts. 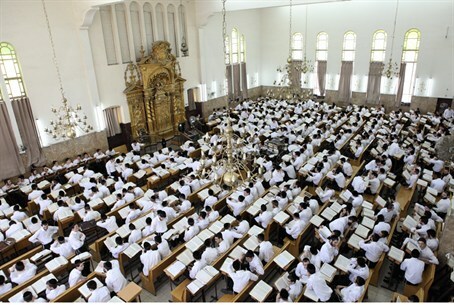 However, a leading figure in the religious-Zionist yeshiva world who spoke with Arutz Sheva warned against taking the government announcement as a sign that Zionist yeshivas are out of trouble. The new criteria are aimed at giving the government an excuse to cut yeshiva funding, by setting unrealistically high targets for enlistment, he claimed.